Organisation involves the ability to establish what is it that you want to do, to know where to begin the task, to understand the sequence in which to carry it out (including pulling together the necessary materials), to problem-solve in the event of a challenge, and the ability to persist with the task to completion (and within an appropriate time frame). Organisation is an important aspect in play, language, social interaction, personal management (e.g. self-care tasks or bringing home all their belongings from school), and academic task performance (e.g. homework, project planning and performance). 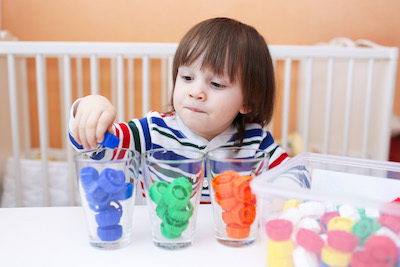 Organisation is typically a skill that needs to be specifically modelled, supported by sensible structures (such as diaries or visual charts, labelled storage containers) and reinforced by realistic routines (pack away one toy/task before commencing another). Organisation is important to develop a structured and consistent approach to tasks at all times, but is even more important for those with poor planning and sequencing, language challenges, attention difficulties and learning difficulties. Your child is generally ‘disorganised’ (lacks awareness of time frames, the materials needed for a task). Struggles to get themselves ready on time. Has difficulty collecting the materials needed for play activities. Has difficulty putting multi-step tasks together (e.g. construction). Appears lazy and not completing work (when in fact they may not know how to start the task). Gets distracted easily or shows poor attention to the task. Has difficulty getting thoughts down on paper. re-count an event or express ideas and thoughts. If you are concerned about Organisation please call us on 1800 KIDSENSE (1800 543 736) to discuss your options.